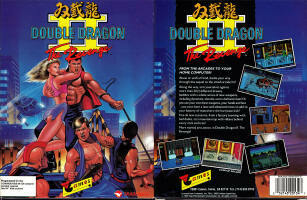 In all the hype and glamour that was Double Dragon, loads and loads of conversions to home consoles and computers were made. While some of these attempts were impossible (Atari 2600), some should have been pie, like the Commodore 64 conversion. 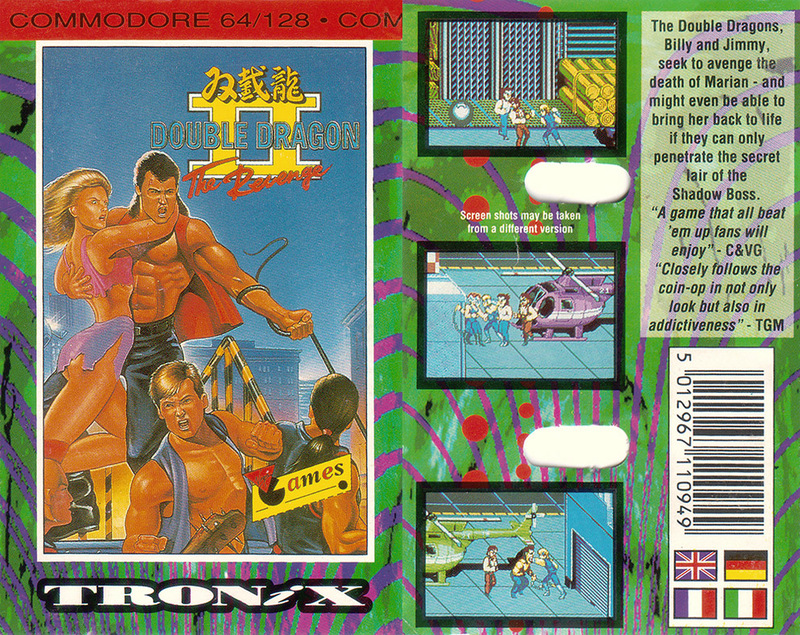 Unfortunately, this wasn't so, and what Melbourne House released for the C64 was essentially a steaming pile of crap that vaguely resembled Double Dragon. A year later in all the hype that became Double Dragon II, Tradewest licensed the game to American Technos to do the conversion, and to Virgin for publishing. 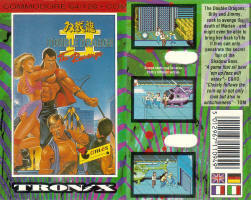 What resulted were better ports for every computer platform this game was released for, and the C64 was no exception to this. Well, this was actually one of the bad points of the game. Everything looks kind of grainy and blocky. Honestly, an Atari 7800 could have done this. But it isn't hideous, it's just not what the C64 was capable of. That said, all characters are easily distinguishable, everything is very colorful and the screen scrolls pretty well, though there is some slowdown here and there. Overall it's a good job, just not a great one. I guess the developers had to trade looks for speed. The music in this conversion is actually pretty good for the C64, though certainly not the best I'd ever heard. However, all punches, kicks, throws and other attacks all sound more like a breaking twig than what they're supposed to sound like. Overall, the sound effects are pretty weak, but the music's okay, though none of it seems to be ported from either the NES or arcade versions. Not too shabby, but this area definitely needed more work. This was actually done pretty well. Most characters from the arcade are actually here, and all attack in their own distinctive ways. Even all of the bosses and sub bosses are here, though they do miss some of their mid-round appearances. While some of the characters (like Abore) are very deformed, most are pretty well done, though some color schemes are off. Nicely done, overall. My only gripe is that all standard hits, whether they be kick, punch, jump kick or cyclone kick inflict the same damage. The only advantage to the cyclone kick is that it has the potential to inflict three to four hits. That was kind of lame. Except for the shovel, all the arcade weapons actually made it home to the C64. That means six out of seven weapons made it home. That's not too shabby for such old technology. Unfortunately, when holding any weapon you cannot jump, kick or whatever. All you can do is swing or throw your weapon. One more note: The grenade does not flash when it's about to go boom, so just stay away from these. As infinitely more graceful as this is over the C64 conversion of DD I, it's still a bit sticky and sluggish, especially with all the slowdown. Most of the moves are here, but the two-directional system has given way to standard motions for punch, kick, jump and whatnot. The moves are somewhat difficult to pull off with only one controller button, but the programmers made do. I'm just glad the cyclone kick made it here, though it's a bit useless. One player and two player. That's it. Too bad there's no versus mode here. Billy and Jimmy don't get to fight at the end of the game either. I was actually pleasantly surprised when I bought this game for my old beast in 1989. Having already owned the colossally disappointing C64 version of DD I, I honestly didn't expect much. Technos did what it could with aging, dying hardware and pulled out the stops to make pretty much as close of a conversion as possible. Really nice. Just as a note: The funky vertical lines at the bottoms of most of the screen captures resulted from me being able to only find a cracked version of the game to play via emulator. Otherwise nothing was affected, so these shots give you the general idea.